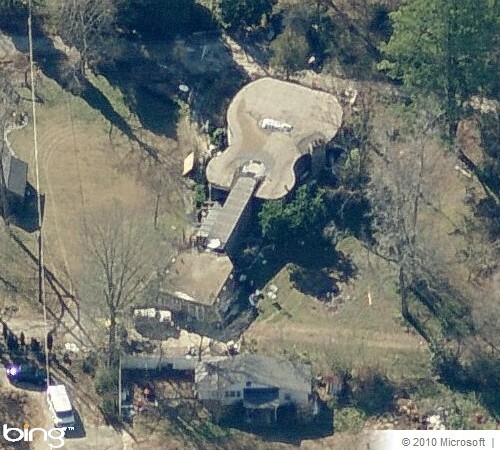 Elvis Cardin, a Georgian Country song writer and singer, had designed and built this strange looking Guitar House. The house took 16 years to take final shape. The main ranch house has a long walkway/hallway leading to the garage thus creating the guitar shape. Its flat roof has electrical wires running along the top to mimic the strings. 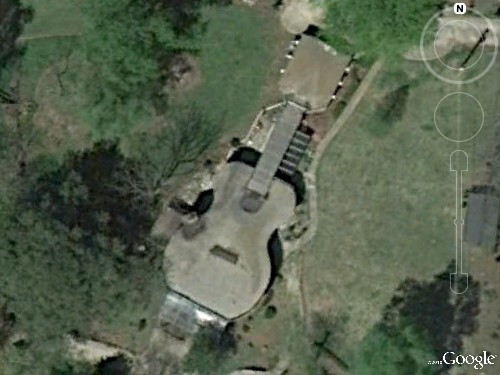 The singer was so inspired by the house that on its completion, he even created an album "Living In an Old Guitar". 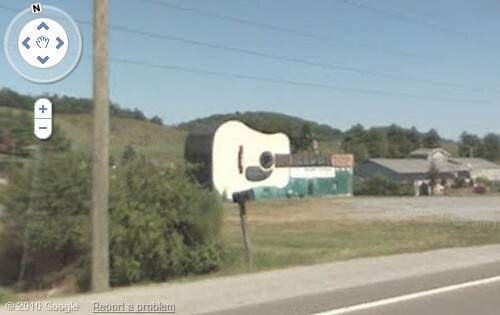 Main Source of info: Elvis Cardin Official Webpage / GEC Forum Post "Guitar House in Georgia"
Bristol, Tennessee, is officially recognised as "Birthplace of Country Music" as some of the first commercial recordings of 'Country Music' were recorded here. 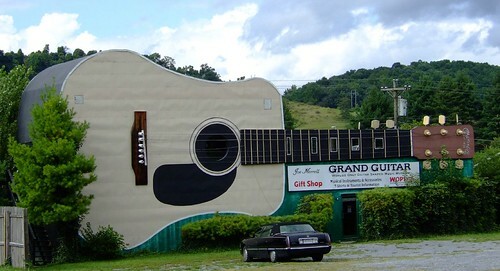 The Guitar Museum in the town, known as "Grand Guitar" is a 70 feet (~21.34 metres) long three story high guitar shaped building with guitar neck inlay and sound hole as windows. Built in 1983 it houses a collection of rare and unusual musical instruments from around the world, ranging from primitive American handmade to exotic instruments including guitars, ukuleles, lap steels, resonator guitars, banjos, mandolins, dulcimers, auto harps, and violins. Besides museum the building is also a shop for musical instruments and accessories along with a gift shop.